One of the challenges facing Colombia, and indeed any country that has been at war for an extended period of time, is the process of rebuilding communities as they move towards constructing lasting peace. Community development undoubtedly goes hand-in-hand with post-conflict solutions, and while the government and international aid organisations do what they can to reach this end, a number of non-profit organisations have also stepped in with social upliftment programmes that work at a more local level. One such example is the Proyecto Escape outreach programme in the Soacha municipality to the southwest of Bogotá. Proyecto Escape was created by residents of the Altos del Pino section of Cazucá, the largest settlement of its type in Colombia. This vulnerable area is inhabited by a high number of internally displaced people, many of whom have fled extreme violence and other dire conditions in other parts of the country. Through their outreach programmes, organisers of the initiative say their aim is to promote peace and improve the lives of children, young people and mothers by enhancing their skills and competencies through workshops and training programmes. The creators of the project say that by working through a different perspective, they seek to positively impact people using cultural tools such as art, environmental awareness, academic development and sports. In addition to their ongoing activities, the group also hosts occasional workshops, like the one taking place May 17 to 20, during which participants will learn about bio-construction using traditional and sustainable eco-friendly methods. Asked to elaborate on bio-construction, he explains that it’s all about working with naturally occurring materials that are easy to get hold of, and using the same techniques that our ancestors used, and which many indigenous people still employ today. “There are a variety of techniques, but it’s basically construction using mud and locally sourced wood, working in harmony with the land. It’s also a way of encouraging people to work together,” he adds. 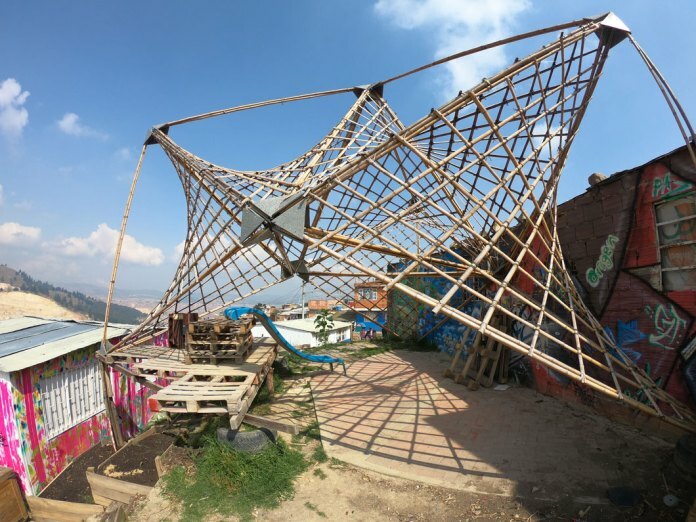 The Cazucá workshop was organised by Proyecto Escape, Universidad Piloto de Colombia and Urbz Colombia with the support of Arquitectura del Oximoron, Semillas Costa Rica, Observatorio Urbano de La Salle and Tierralab. The goal, say the organisers, is to improve the living area used by over 400 children. At the end of the four-day training programme, the community will benefit from new public toilets and showers as well as a communal laundry area and recreational spaces, which participants will build. Written by Laura Brown for The Bogota Post on 12.05.2018. 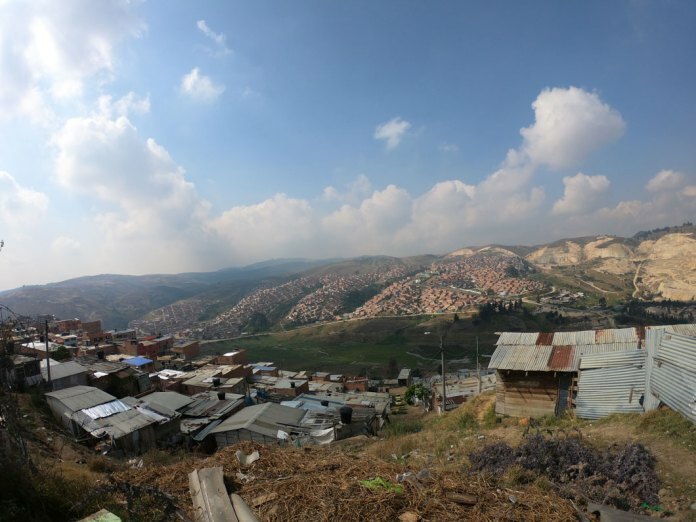 The 2nd Workshop in Emerging Architecture and Urbanism in Altos del Pino, Bogotá, supports the initiatives of the community for the construction of public toilets and improvement of public space.